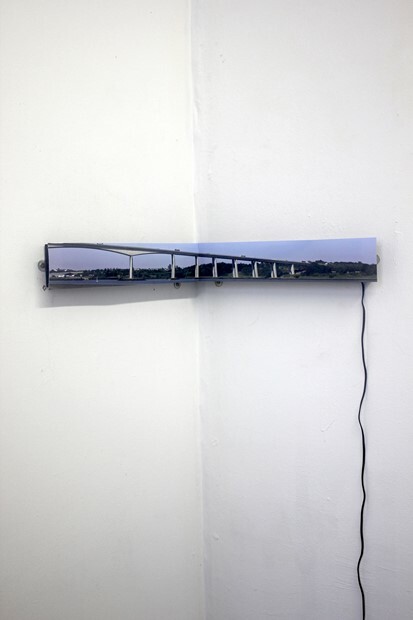 Using photography to explore ideas of the aural through the perception of what is seen to what is heard, Sur et Sous presents an image where the perceived sound is of the vehicles on the bridge and of the estuary of the River Stour. What is actually heard, and, even then, only by stepping up closely to the image, is a recording made underwater. Recorded only fifteen centimetres under the surface from the stern of a yacht near the centre of the river, the sound is one of strangeness, of unknown and unidentifiable occurrences although birds can be heard at one point.